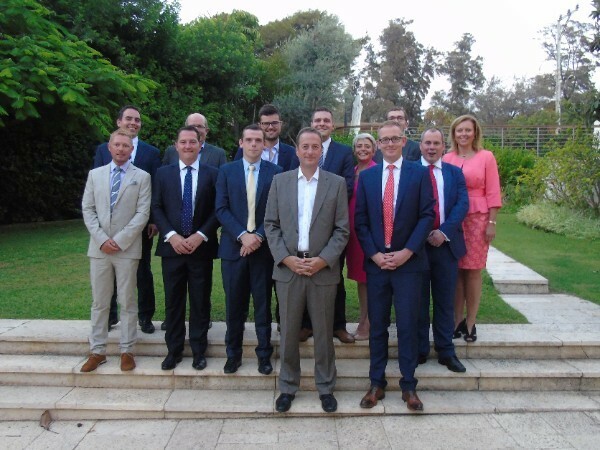 Often speaking of his desire to “strengthen ties between Glasgow Law School and legal scholars in Israel” Tomkins gained his reward in winning the Hebrew University’s Hailsham Scholarship for his work in promoting links between the UK and Israel. 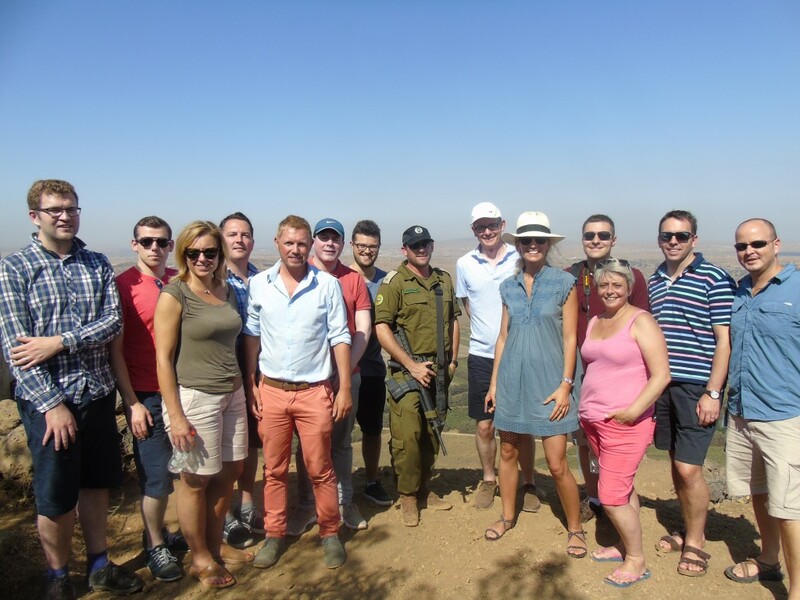 Tory Party MSP’s, tabled two Scottish Parliament motions congratulating the International Shalom Festival on its Edinburgh Festival Fringe event, organized by the Confederation of Friends of Israel, Scotland. A day-long celebration of the cultural diversity of Israel. And emphasizing that boycotts against Israel must be opposed. “Stands with the organizers and artists associated with the festival in advocating peace and security for the world’s only Jewish state, and applauds everyone who seeks to foster closer cultural links between Scotland and Israel”. “It believes that the fringe must be a festival at which culture is embraced rather than boycotted, and hopes to see the return of The International Shalom Festival in 2017 for another successful outing”. Note: Protesters demonstrated outside the peace festival venue, reminding those entering that, “Your tickets are covered in Palestinian blood”. Gillian is the sister of Lauren Apfel, wife of Adam Tomkins, Tory MSP and constitutional affairs spokesman for the Tory party in Scotland. She and her husband Rodney Ford are senior diplomats with the US State Department. She was influential in deciding US foreign policy when deployed to Bagdhad, Iraq and, not to be outdone, her husband Rodney, as a foreign diplomat actively influenced the outcome of political events in a number of countries in Africa over a period of 20 years. This short review of their involvement in the affairs of African and Middle East nations exposes the hypocrisy of US foreign policy under the last four president’s and the callous support provided by the UK government. Between them the the two nations are culpable in the destruction of many countries in Africa and the Middle East, all in pursuit of control of their assets. What is puzzling is the decision of Tomkins to take up residence in Scotland, for which he has no affiliation, when he would be guaranteed a more financially lucrative career in the US where his wife’s family enjoys significant political clout. Reflecting on his his participation in Scottish politics I am reminded of Daniel Defoe and his infamous spying role in support of England at the time of the 1707 Treaty of Union. Rodney Ford: Diplomat. Foreign Service Institute. Department of State: Washington D.C.
August 2016 – June 2017. Graduate Student – National Security Studies. National Defense University – National War College. Washington D.C.
August 2014 – August 2015. U.S. Department of State. Deputy Director, Bureau of African Affairs, Office of Public Diplomacy and Public Affairs. U.S. Department of State. Washington D.C. Oversee the allocation of more than $38 million in public diplomacy programming, providing daily policy guidance and program support to 49 Public Affairs Sections across Africa, and oversee public diplomacy personnel assignments for the Africa Bureau in Washington and in the field. July 2013 – July 2014. Spokesperson. U.S. Embassy Baghdad, Iraq. Responsible for all media-related activities advancing the U.S.-Iraq Strategic Framework Agreement. August 2010 – July 2013. Information Officer. U.S. Embassy Rabat, Morocco. Served spokesperson and senior adviser for all media-related activies for the U.S. Mission to the Kingdom of Morocco. July 2007 – July 2010. Public Affairs Officer. U.S. Embassy Antananarivo, Madagascar. Directed U.S. public diplomacy efforts in Madagascar and the Union of the Comoros. Advised the Ambassador on issues related to U.S. interests in Malagasy and Comoran media. June 2004 – December 2006. Assistant Cultural Affairs Officer. Bureau of Afican Affairs. Managed full range of U.S. exchange programs with South Africa. 2002 – 2004. Consular Officer. U.S. Department of State. Sep 2017 – Present. Foreign Service Officer. U.S. Department of State. Arlington, Virginia. Studying Italian at the Foreign Service Institute in preparation for assignment at the US Embassy in Rome. Aug 2015 – Aug 2017. LNA Coordinator. U.S. Department of State. Aug 2013 – Aug 2014. American Citizens Services Chief. Baghdad, Iraq. Refugee Coordinator for Admissions. Working at the US Embassy in Baghdad resettling Iraqi refugees in the U.S.
Jul 2012 – Jul 2013. Program Officer, Working at the Operations Center in Crisis Management Support. U.S. Department of State. Washington D.C. The Rwandan government’s warped historical record of massacres in Central Africa was used to provide credence to President Paul Kagame’s 25 year totalitarian rule in Rwanda. It was also used to justify the U.S.-backed invasion, occupation and plunder of the immensely resource rich Democratic Republic of the Congo, despite many U.N. reports documenting Kagame’s army’s atrocities in both Rwanda and Congo. Kagame was shielded by powerful friends, including Clinton, Blair and Obama. But any attempt to cling to power beyond 2017 would not be supported by the US, the UK and the EU. Kagame is a longtime ally of former president Clinton who presented him with a Global Citizen Award in 2009. Asked about his closeness to Kagame, Clinton said that war crimes, crimes against humanity and genocide crime that Kagame is accused of in U.N. reports had never been adjudicated in a court of law. Critics commented that U.S. administrations made sure that Kagame was never indicted by an international court. Global Witness is taking the British government to court for allegedly failing to report companies trading Congolese “conflict minerals”. The organization alleged that British companies had been trading in minerals controlled by armed groups in DR Congo in defiance of United Nations sanctions introduced in 2008 and 2009. Global Witness said groups controlling the trade in minerals such as tin and tungsten use the money generated to buy arms to fund campaigns against civilians. A group legal adviser said it was applying to the High Court in London for an order requiring the government to put forward for sanctions British firms violating the UN resolutions. She said: “We approached the UK government in early 2009 once sanctions were passed where you could list entities supporting armed groups for sanctions. We decided to take advantage of that and requested they put forward certain names. But no action was taken. A UN report detailed the mass killing of Hutu refugees by Rwandan forces in the Democratic Republic of Congo in the late 1990s. The document investigated allegations of genocide and other human rights abuses in eastern DR Congo, between 1993 and 2003 when over a million Hutus fled to DR Congo in the wake of Rwanda’s 1994 genocide. The report identified “systematic attacks” against Hutu refugees by the Rwandan army – and the Congolese rebel group the AFDL – in the years 1996 to 1998. Kagame spent many weeks attempting to quash the report and threatened to pull Rwandan troops out of UN peacekeeping missions over the allegations. There was a U.S.-backed campaign to destabilize, depopulate and colonize Eastern Congo/Zaire since the first U.S.-supported invasion of 1996, which occurred under President Clinton, and which followed the U.S. destabilization and coup d’etat in Rwanda. In 2001 the U.S. and its allies, again deployed their proxy army, the Rwandan Patriotic Front (RPF), comprising many child soldiers, in a secret campaign to balkanize Congo and create a Republic of the Volcanoes in the region. The mission was to expand Rwanda through the annexation of the Kivu and Maniema Provinces. Fellow participants Uganda also with U.S. support, set out to annex the Ituri province. The campaigns were backed by multinational corporations, and the goals were political, military and economic. So President Barack Obama invaded Congo, the heart of Africa, on his Inauguration Day? The U.S.-backed military invasion of 20 Jan 2009 included U.S. military commanders, special forces, military advisers, technicians and other U.S. military personnel, and it involved weaponry supplied by the U.S. and Britain. Kagame’s former chief of external intelligence, Patrick Karegeya, was found murdered in a posh Johannesburg hotel. In exile, Karegeya had secretly been advising South African and Tanzanian intelligence. Comment: So the U.S. supported a President complicit in the murder of former spys resident in foreign lands. Rwandan legislators voted in support of a referendum allowing President Paul Kagame a third term in power, backing a petition signed by millions of citizens. The Rwandan constitution, adopted in 2003, limited the number of presidential terms to two, and therefore barred Kagame — elected first in 2003 and again in 2010 — to stand for a third term. But petitions signed by a total of two million people demanded that Kagame be allowed to stay in office. Parliament subsequently amended the constitution allowing Kagame to run for a third term of office. Addressing the press Kagame said that he was open to going or remaining based on what Rwandans decided ahead of 2024. Bureau of African Affairs spokesman Rodney Ford said the U.S. will not support Rwandan President Paul Kagame’s bid to abolish Rwanda’s constitutional term limits so that he can remain in power. Ford’s statement came as a surprise because Rwandan President Paul Kagame has been such a close, longstanding and useful ally and “military partner” to the U.S. Comment: Kagame ignored the US State Department instruction and got himself elected yet again. And the US is still backing him because they need his army to police other states. Paul Kagame, 59, the controversial president of Rwanda, won a landslide victory in the African state’s election, securing a third term in office, extending his 17 years in power. The result will surprise no one, inside or outside Rwanda. Kagame won international praise for the stability and economic development he brought Rwanda since the 1994 genocide, when an estimated 800,000 people were killed, but he has also been accused of running an authoritarian, one-party state. In May 2013, the U.S. Army posted a story on its official website announcing that soldiers and special operators would train a Nigerian 650-man Ranger battalion to fight Boko Haram, marking the first time that U.S. troops would train their African counterparts for a mission other than peacekeeping. But only 8 months later it emerged that the Nigerian government had terminated the U.S. effort to train a battalion of its troops to fight Boko Haram, an Islamist terrorist group responsible for abducting hundreds of schoolgirls earlier in the year. The move followed the U.S. refusal to sell Cobra helicopters to Nigeria. The transfer being denied over concerns that Nigeria couldn’t properly use and maintain the Cobras, a State Department spokeswoman said. The decision drew criticism from Nigeria’s ambassador to the U.S., who said it would hinder the country’s efforts to bring down Boko Haram. American law prevents military aid to countries that employ child soldiers—but that hasn’t stopped the US in South Sudan where approximately 13,000 children have been recruited into armed groups, according to the United Nations children’s Fund (UNICEF). In 1996, the United States began funneling military equipment through nearby Ethiopia, Eritrea, and Uganda to rebels in southern Sudan as they battled for independence. A decade later, after the civil war ended in a peace deal, Washington officially began offering military “assistance” to the SPLA, according to State Department documents. Training and equipping of the elite presidential guard. Construction of a new SPLA headquarters in Juba. Renovation of a training center at the SPLA Command and Staff College in Malou, a town north of the capital. Construction of the headquarters of two SPLA divisions in the towns of Mapel and Duar. Training programs for general officers and senior instructors. Deployment of a “training advisory team” to guide the overhaul of intelligence, communications, and other key functions. Employment of Kenyan and later Ethiopian instructors to teach basic military skills to SPLA recruits. Provision of secure voice and data communications to SPLA general headquarters. Development of riverine forces and up to 16 tactical watercraft. Training of commando forces by Ethiopian troops. Establishment of a non-commissioned officers academy at Mapel with training from private contractors and later US military personnel. Comment: Disgraceful support of military forces largely staffed by under aged children. But the oil is the key factor. In 2008, the U.S. Congress authorized a Special Immigrant Visa program to allow Iraqis, Kurds and Afghans who had worked for the U.S. government and were now in danger for doing so, to immigrate to the U.S.
For more than five years, Iraqi Judge Hussen Al-Anbaki worked alongside U.S. troops battling to bring terrorists to justice only to be denied safe haven in the USA. Now he’s engaged in an even bigger fight — trying to get himself and his family into the U.S.
A local state prosecutor and a New Haven immigration lawyer are spearheading an effort to convince the U.S. government to issue Al-Anbaki and his family special visas. They say with U.S. troops gone from Iraq terrorist groups have become emboldened and are assassinating judges, and they are worried Al-Anbaki is next on their list. Comment: A cold unfeeling response from Gillian Apfel, to a plea for help from someone who put his own and his family’s lives in jeopardy in support of the US.